Are you Looking for a Special Way to Send your Love? 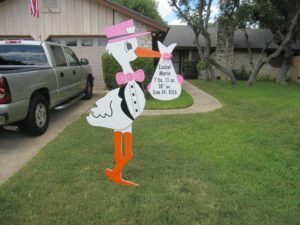 Order a Flying Stork Stork Sign Rental in Maryland? 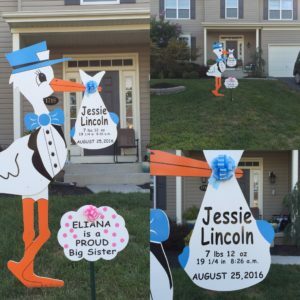 Please contact Flying Storks at (301) 606-3091 for more information or to book your stork yard in Maryland today! We deliver to: Frederick County Maryland & Montgomery County Maryland including: Adamstown, Beallsville, Bethesda, Bethesda Chevy Chase B-CC, Boyds, Braddock Heights, Brunswick, Boonsboro, Clarksburg, Chevy Chase, Damascus, Darnestown, Derwood, Dickerson, Gaithersburg, Germantown, Green Valley, Knoxville, Ijamsville, Jefferson, Monrovia, Myersville, Middletown, Mt. Airy, Olney, Point of Rocks, Potomac, North Potomac, Poolesville, Rockville, Silver Spring, Woodsboro, Urbana, Walkersville, MD All of Montgomery County, Maryland and Frederick County, Maryland, Georgetown Washington D.C.